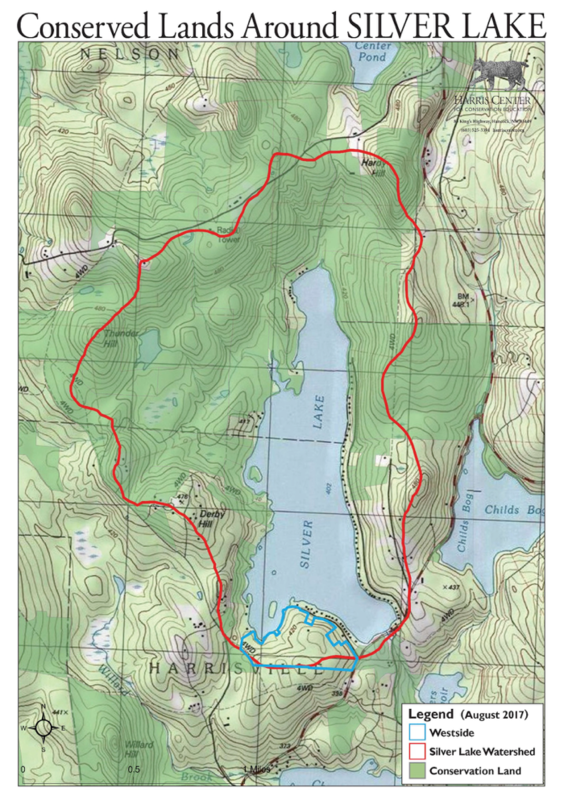 The Silver Lake Land Trust is excited that the Harris Center and John Newcombe (representing Seaver Silver Lake Farm Trust) have finalized an agreement to conserve an additional 187 acres on Silver Lake in Harrisville. This large tract is adjacent to the land in Nelson that the Seaver Silver Lake Farm Trust put into conservation in 2010, and will protect an additional 77 acres in the Silver Lake watershed as well as 110 acres in the Child’s Bog/Seaver Reservoir watershed. Putting this land into conservation means that approximately 75% of the land in the Silver Lake watershed is protected from development. Combined with the Seaver Silver Lake Farm Trust land in Nelson under easement, development on these two easements is limited to a single building set well back from the shoreline or to the existing campsite in Harrisville. 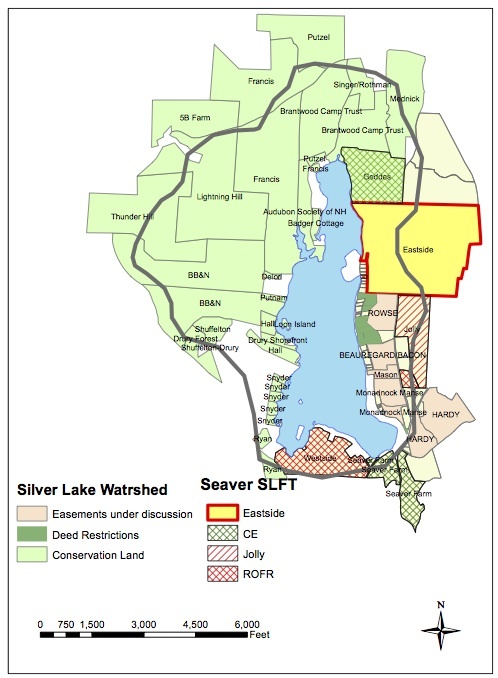 The Silver Lake Land Trust has pledged all of its assets toward the easement purchase price. A $350,000 gap remains, which we must fund raise by September 30th of this year.We want everybody who loves and enjoys Silver Lake to have the opportunity to give. This is a gift to all – past and future generations. It is because our parents and grandparents taught us to treasure the Lake’s water quality, just as we are working on behalf of our kids and grandkids to preserve this beautiful lake. Note: checks are the preferred method of payment, avoiding transaction fees of 2.5% to 3%. Call the Harris Center at (603) 525-3394, and ask to speak with Sara LeFebvre, Diana Jacobs or Jeremy Wilson. Visit www.harriscenter.org and click on the yellow “Make a Donation” button. After entering payment and submitting donation, you will be asked to review the information. Click on “Add Special Instructions to the Seller” and type in Silver Lake Eastside Easement. Contact Diana at jacobs@harriscenter.org with questions. The Harris Center for Conservation Education has a nonprofit status under section 501(c)(3) of the U.S. Internal Revenue Code. Donations to the Silver Lake Eastside Easement will be acknowledged with a letter verifying receipt of your tax-deductible contribution.